Nice little player for playing Flac music. You can also add to plank as a shortcut. For Windows I use MediaMonkey. I have a bigger MP3 collections (also FLAC) and need a program for managing that. I also like that it is highly customizable. You can also play videos, but for that I use a VCL based player. 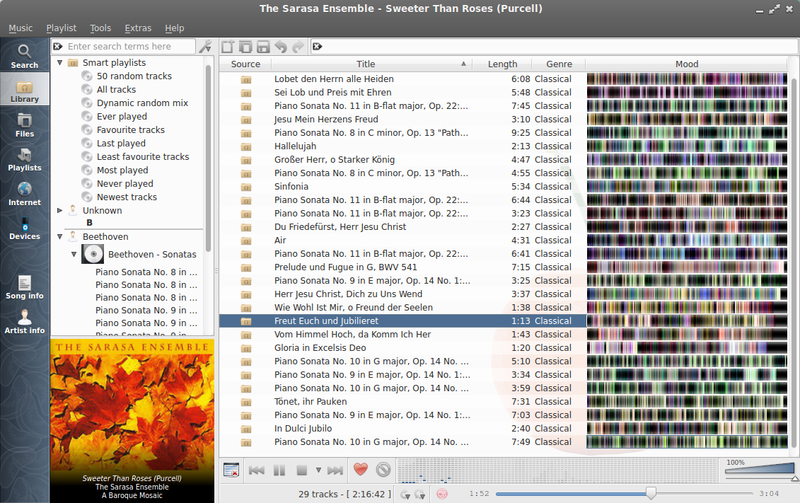 For Linux I use Clementine Music Player. Meanwhile it's also available for Windows. I don't know a program for music and videos. Is there any? And no, the VCL Player is not made for music. Those are pretty neat media players there fellas. Seeing these reminds me of the old Winamp days. Ah, take me back. i too use mediamonkey for music and VLC for video. i mean, anything is better than that gawd-awful iTunes, right? As an alternative to VLC player I like to use MPV. I use the old Winamp 2.91c, takes 5x less cpu than nowadays windows mp3-player. For windows, you can add this player to the list of nice music players.. been using for years. Great for large collection and highly customizable. its free but not open source.